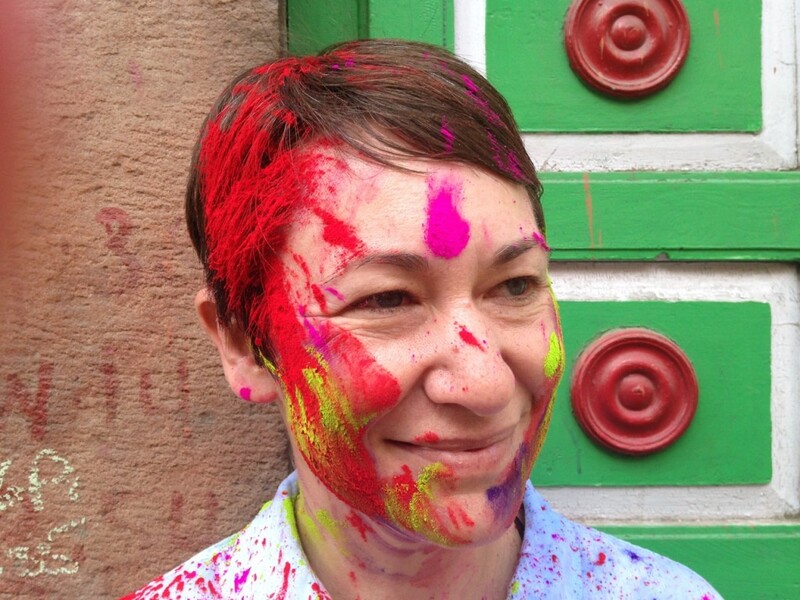 Browse: Home / Happy Holi! Families have been stocking up on brightly colored powder for days. Vast rooftop squirt gun and water balloon arsenals have been assembled. Tonight is Phalguna Purnima, the full moon marking the vernal equinox. 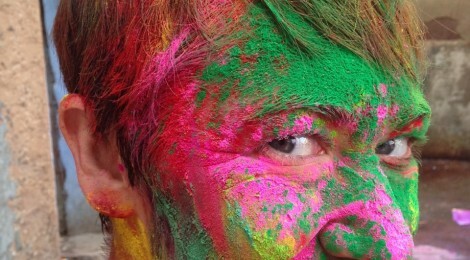 Happy Holi, the Hindu festival of colors! 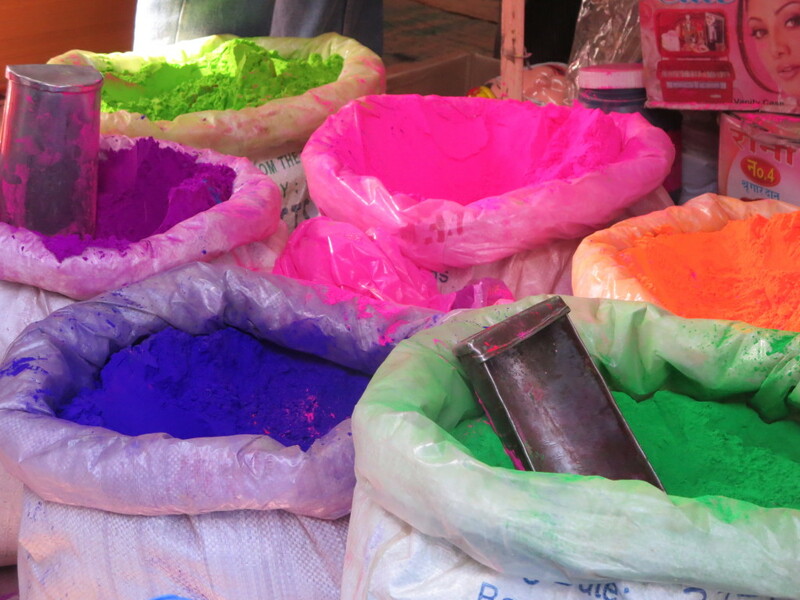 Holi colors for sale on the streets of Jodhpur, India. Shopkeepers and other adults in various states of cleanliness all greet you warmly with “Happy Holi” as you pass. You turn the corner and, at the end of the alley, a merry band of water balloon-wielding kids awaits. Soaked and saturated, they foreshadow your immediate future. They have been playing Holi for hours, and resemble a friendly rainbow zombie horde as they approach and envelop you in a cloud of color. Your face and torso are transformed again and again throughout the morning from emerald green to vivid marigold to blinding fusca. An especially riotous mob invites you to sit with them on the curb and cheer as a parade of technicolor scooter drivers goes by; each is greeted with splashes of water and fistfuls of fresh powder as they pass. No dog or cow is spared. A young man with an indigo face decorates you with silver sparkles. A small girl shyly approaches before sprinkling you with a vermillion powder that smells intoxicatingly of roses. Chris and our indigo Indian companion. There is no point in attempting to wash your clothes. Bag them, bid them farewell, step into the shower and watch as each interaction from the day flows in a never-ending rainbow stream to the drain. There is no amount of scrubbing that will clean the magenta out of your toenails or the silver hairs at your temples. India has claimed you as one of its own and forbids you from taking yourself too seriously, at least for the next week. 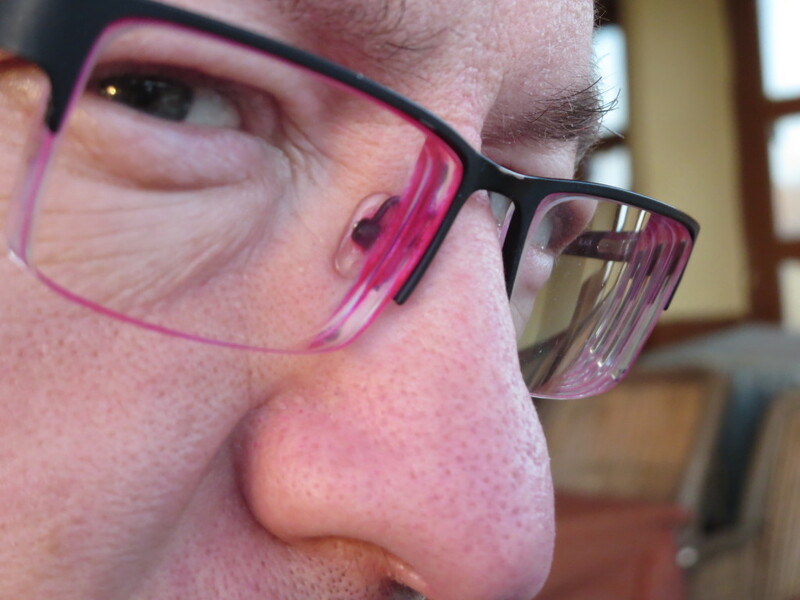 Chris views the world through rose colored glasses. Rose colored glasses I could almost deal with…glitter…not so much. I recall a line from Frosty the Snowman uttered by Professor Hinkle: “Messy, messy, messy!” My non-Indian “sensibilities” in a whirl of colored distraction. 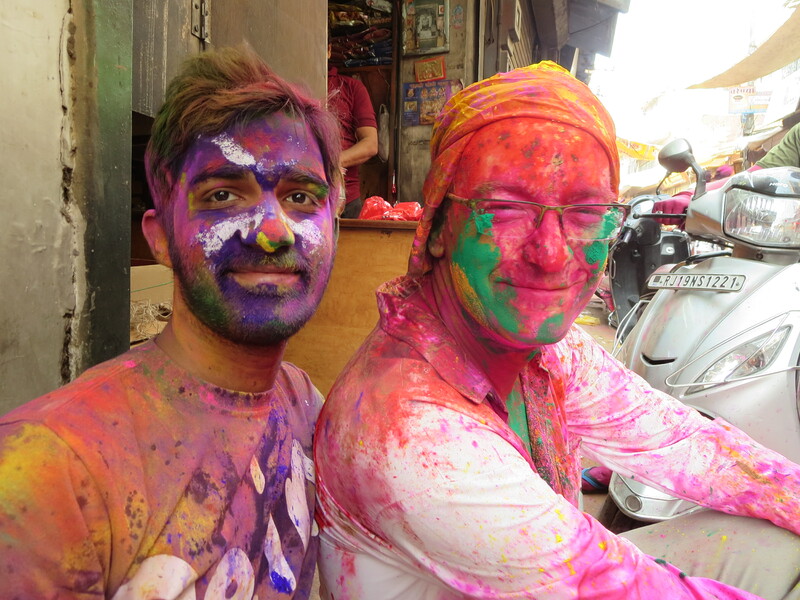 “Messy” is a sublime understatement about India in general and Holi in particular. Looking back at the pictures of our Holi progression, I am unsettled. If I were not so familiar with the shape of Alison’s eyes, I think I might not recognize her as my spouse in some of those shots. I don’t have the tools to disassemble my spectacles, and we haven’t been anywhere long enough for me to take them in and have a lens crafter take them apart and clean them off. Perhaps I can get that done in Bangkok. Alison suggests I get a new pair of frames while I’m here. My toenails are still stained red too, in spots.